Bergen International Festival. Also, for most visitors, it can be a party just wandering around Bergen on a balmy summer evening. The streets throng with people milling in and out of cafés sampling food or enjoying a beer. My recent trip to Bergen Norway, left me speechless for days! No words or images could accurately show the beauty of this wonderful location! I went with my toddler son, and we ventured MANY times up Mt. Floyen and enjoyed their many walking trails and "Troll Playground". The Fjords to Gudvangen...still I have no words for. Breath-taking doesn't even do it justice. It was as if you could hear the echos of the ancient gods and goddesses within the mountains and waters. It took you back in time, in such an enchanting way, that you will truly forget where you are! I cannot recommend this area enough! My trip #2 is planned already, for next year! I can't wait to explore the areas again! 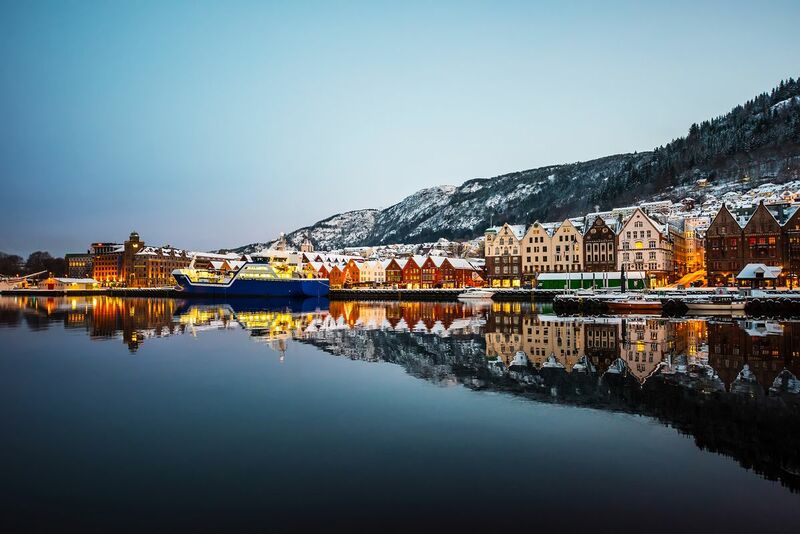 Bergen is one of the most beautiful towns in Norway. Located on the water north of the capital, it offers narrow cobblestone streets, old wooden houses, and serves as the gateway to the fjords. From here you can take excursions out to see the fjords, with all their waterfalls and soaring hills. Norway's second city is arguably its cultural capital. Besides outstanding music and arts, the visitor will enjoy Begen's old buildings and picturesque houses climbing the hillside around the city. This is a city made by the water and its maritime imprint is etched in all corners of its past and present. Bergen, like many Norwegian cities, is very accessible to outdoor sports in all seasons. Bergen is an exceptionally nice city, especially in the summer, and particularly when the weather is good. Enjoy! Beautiful combination of city life and wilderness as this city is atop of the mountainside, by the fjord. Love this city! This is a small city in Norway which has a wealth of outdoor activities. The fish market, the Bryggen Hanseatic league buildings and the funicular make for a very good day. Amazing small town near the stunning fjords! Just stroll around the port area and city medieval center!